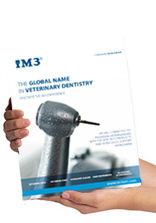 iM3 Products are sold throughout the world with specialised distributors chosen in each country to help you make the right choice in Veterinary Dental Equipment. We work closely with all of our distributors, sharing our wealth of knowledge on veterinary dentistry with them so you can rest assured you are receiving the same quality service you have come to expect from iM3. To obtain contact details of the distributor servicing your country/region, click on the relevant link below. If you are not able to locate a distributor please contact iM3 directly on the details below. DIAG Import & Export CC.